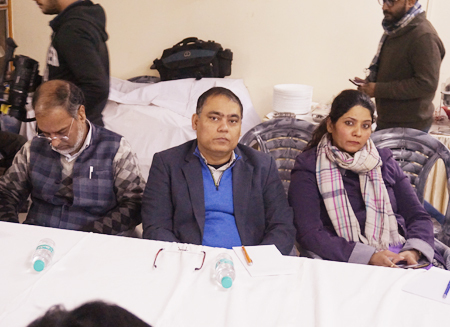 The Institute of Objective Studies organised an informal meeting with Delhi-based journalists on January 16, 2019 at its conference hall of the IOS in which issues ranging from under-representation of views of the minorities and the NGOs working in the field to the current role of the media, were discussed. Initiating the discussion, the Secretary General, IOS, Prof. ZM Khan, held that the media were well aware of how the system worked. Since the independence movement in the country, India had been consistently playing its role in a positive manner. This continued till the freedom struggle ended with the attainment of Independence. This period saw the emergence of several ideologies like Leftism, secularism, etc. Then came the moment when the Constitution of India was drafted, which represented the aspirations of the people. The framers of the Constitution made it sure to accommodate human values and liberal thought. He said that equality, liberty, justice and fraternity formed part of the Preamble to the Constitution, which made India a Democratic Socialist Republic. But then, the question arose if we had a formal instrumentality to correct the system. It was up to the people to correct the system. The uniqueness, of the country of about 1.3 billion people lay in unity in diversity, which was first propounded by Jawaharlal Nehru. Referring to scientific temper, he said that it was about taking cognizance of the relationship between cause and effect. Expressing concern over the attempts being made by the RSS and other revivalist outfits to undermine the Constitution, he said that they had been opposing its philosophy ever since it was adopted and given effect to. He emphatically said that the basic structure of the Constitution could not be changed. This had been ruled by the highest judiciary of the land more than once. These organisations were busy polluting the atmosphere by foisting their ideology, which went against the spirit of the Constitution. If this was allowed to sustain, the atmosphere in the country would be changed for the worse. This called for a positive role of the media, the universities, research organisations and the NGOs as they were also under constant threat. This could be corroborated by the fact that the funding to NGOs was being stalled, autonomy of the institutions being affected by direct interference in their functioning. Meaning thereby, the current phase was affecting all those who mattered. He maintained that the media faced a bigger threat, and if it failed to discharge its duty to inform the people of the happenings, media persons would also be held accountable for the failures. “Against the backdrop of the consolidation of reactionary and obscurantist forces, we must resolve to work together for the preservation of the Constitution”, he said. He expressed the grudge against the media by saying that the Institute did not receive the press coverage due to it. The Institute looked to the media for co-operation because the purpose of both of them was similar in several respects. He regretted that there had been a total blackout of the coverage of the functions and the activities of the IOS in the Hindi and English press. He said that the Institute shared their concern and wanted the media persons to speak their mind. He assured them that the communication gap between the two that existed so far would be bridged. 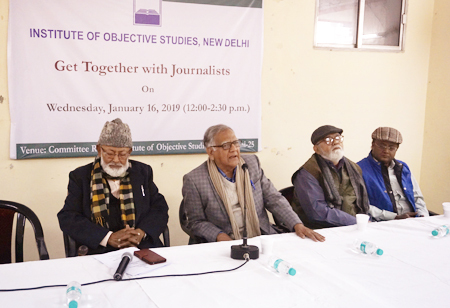 The Chairman, IOS, Dr. M. Manzoor Alam, referred to the challenges being faced by the media and said that a half-day workshop on the challenges before the media would be organised by the Institute in the near future. He held that the suggestions made by media persons would be discussed at the General Assembly meeting and a decision taken. He complained against the indifference of the media, by and large, to the work being done by the Institute in the field of research and publications. In this connection, he mentioned the seminar organised in Kolkata in April 2017, which saw the presence of two senior judges of the Supreme Court and a High Court, among others. The success of the seminar could be gauged from the fact the hall of Alia University, Kolkata was packed to capacity, but the newspapers did not bother to carry the news next morning. This attitude of the media to the genuine work being done by an institutions like the IOS would have to be changed. This was not confined to the IOS alone. Citing such an example, he said that Prof. A.M. Khusro, the ex-vice chancellor of AMU and a noted economist of the country, once wrote an article under his name, but that was not published by any newspaper. It was, however, published when it was sent under a pseudonym. He gave several other examples to drive home his point. 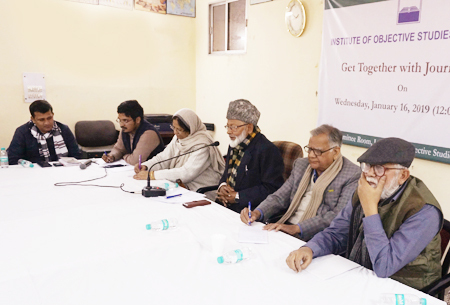 He said that last year Vision-2025 document published by the Institute was released by Prof. Amitabh Kundu of Kundu Committee fame at an impressive function at Jamia Millia Islamia, but the newspapers, including Urdu ones, skipped the news the following morning. It may be noted here that though this was the lone publication of its kind, it failed to register with the newspapers. Another important publication of the IOS, Exclusion of Muslims in India found no space in a newspaper, though it was the only book of its kind in the world. Similarly, there were several other publications of the Institute that had not been published anywhere in the world, but they had been ignored by the press. He noted that the Role of Muslims in the Freedom Struggle and Media in our Globalising World were other leading publications of the Institute that could not attract the attention of the press. He observed that the IOS focused on the issues of national concern. These included study of the issues concerning the minorities, deprived and depressed sections. It was surprising that while the real issues were given a short shrift by the media, the rumour of Ganesh sucking milk became hot news and travelled through the width and breadth of the country. He stressed that there was a greater need to communicate the message of Islam today more than ever before. Commenting on the mainstream media, he said that instead of focusing on positive news, it was interested more in negative reporting. He remarked that the big media houses were acting on the policy of denying news coverage to the issues that highlighted the plight of Muslims. Giving the details of an IOS project underway, he said that a series of 122 booklets in regional languages were being readied for distribution among non-Muslim youth in the 12-22 age-group so as to acquaint them with the basic tenets of Islam. This was aimed at countering the false propaganda against Islam and Muslims. In order to present the true picture of Hinduism before Muslims, another series of books on Hinduism were being prepared. These books would include the teachings of the Gita, the Vedas and the Upanishads, goal of the Hindu religion and the mode of its worship. He informed that Hindutva Aur Rashtravad written by Maulana Abdul Hameed Noumani and published by the IOS, would be released on February 2, 2019. 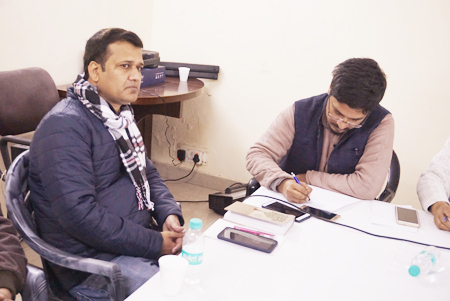 Senior journalist and editor, Urdu weekly, the Chauthi Duniya A. U. Asif, praised the IOS for being the only think-tank of Muslims in India that was engaged in research on socio-economic, educational and political status of the minorities, particularly Muslims and other weaker and deprived sections. He said that the Institute had been associated with the media since its inception through its media arm – the FANA (Feature and News Alliance). He used the occasion to suggest the institution of an award in the name of the first martyred journalist, Baqar Husain, by the IOS. He also suggested that a separate meeting of journalists with the Chairman be held. Senior journalist and the representative of the Voice of America, Urdu Service, Suhail Anjum, held that the media worshipped the rising sun. Media always raised negative issues and never turned to the positive work. Senior journalist Qasim Syed opined that the mainstream media had its own policy and the news relating to Muslims and the Milli organisations normally did not find favour with it. 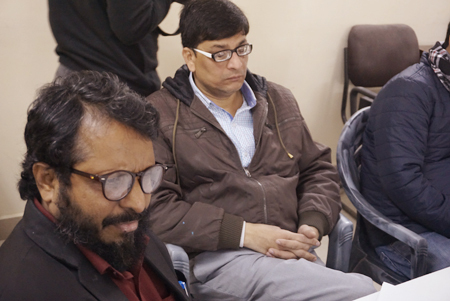 Resident editor of the Urdu daily, the Inquilab, Dr. Yamin Ansari, described the current situation as very volatile and said that the IOS should think over a strategy to face it. Khursheed Rabbani, an anchor in Zee Salaam, held that the IOS was known to him for the last 14 years. He was aware of the news of the activities of the IOS being blacked out by the English press. 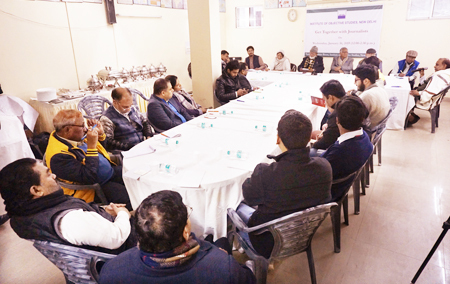 Dr. Abdul Qadir Shams, senior sub-editor of the Urdu daily, Rashtriya Sahara, noted that the IOS was a well-known think tank of Indian Muslims. It had rendered valuable services during the last 32 years of its existence, he said. 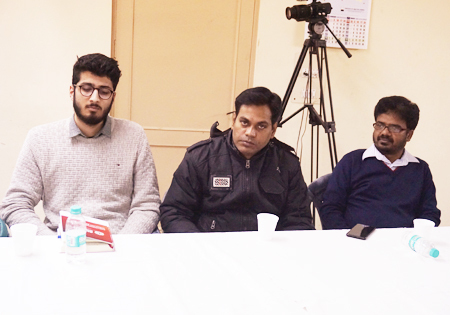 Aamin Saleem Khan, news editor, Urdu daily, Hamara Samaj, observed that Urdu journalists always turned to the IOS for seeking information on Muslim issues. 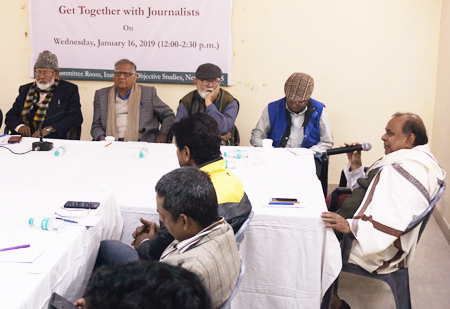 The joint editor, Akhbar-i-Mashriq, Tanveer Ul Haq, editor, News Max, Shakil Ahmad, correspondent, Hindi daily, Shah Times and Hindustan Samachar, Mohammad Owais, bureau chief, Urdu daily Hindustan Express, Abdul Noor Shibli, bureau chief, Urdu daily Mera Watan, Mazhar Husain, correspondent, DD News, Wasiqul Haq, Hina Tanveer, general secretary, All India Majlis-e-Mushawarat, Maulana Abdul Hameed Noumani, asstt. secretary general, IOS, Prof. Hasina Hashia, and ex-professor of History and Culture, Prof. Syed Jamaluddin Ahmad also expressed their views. 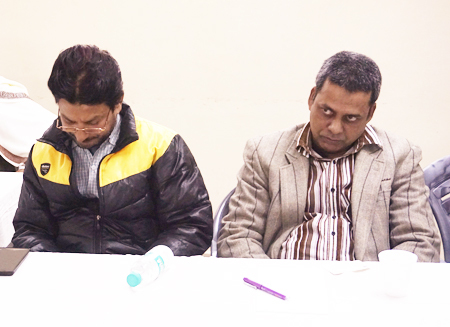 Journalists like Mohammad Shoeb, Jawwad Husain, Dr. Md. 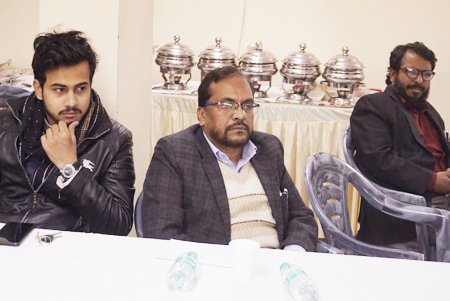 Tauhid Alam and Javed Akhtar, PTI Urdu service, were also present on the occasion. Maulana Abdul Hameed Noumani led the congregation to offer dua for the maghfirat of the rector, Jamia Arabia Ashraful Uloom, Kanhawan, Bihar, Maulana Zubair Ahmad Qasmi and Maulana Wazeh Rashid Hasani Nadwi, Nadwatul Ulema, Lucknow, who passed away recently. 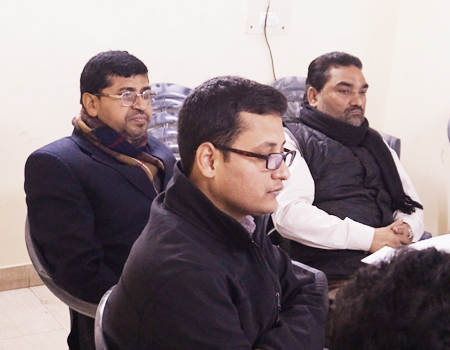 Earlier, the meeting began with the recitation of a Quranic verse by Shams Tabrez Qasmi, media coordinator, IOS, who also conducted the proceedings.